Thermage is the latest most advanced procedure for skin tightening and contouring without surgery! Thermage is the only non-invasive treatment the delivers tighter skin, renewed facial contours and healthier collagen. It has been clinically proven to tighten and gently lift skin to smooth out wrinkles and renew facial contours. The incision-free procedure is in fact an easy treatment, and requires no downtime from normal activities. With each touch to the skin, the ThermaTip device uniformly heats a large volume of collagen in the deeper layer of the skin and its underlying tissue while simultaneously protecting the outer layer of the skin with cooling. This deep uniform heating action causes immediate tightening of the collagen structure, with additional tightening over the next few months. Unpublished reports by experienced cosmetic physicians indicate the results may last 24 months or longer based on the patients natural ageing process. As you age, the collagen inyour skin breaks down resulting in wrinkles and sagging skin. Thermage uses patented radio-frequency technology to safely heat the layers of your skin, stimulating existing collagen and promoting new collagen growth and promoting new collagen growth for younger looking skin. The effects continue to improve for up to six months following a single treatment. Results can last for years depending on your skin condition and natural ageing process. How long before I can return to my normal activities? There’s no special care needed after the procedure and most patients return to their regular activities immediately following treatment. 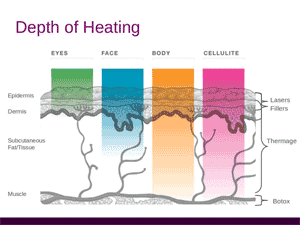 Where can I learn more about Thermage in Bournemouth and Poole? Special introductory offer on BOTOX® treatments two areas for the price of one for only £200. Special introductory offer on BOTOX® treatments three areas for the price of two for only £275.